Published: 08:48 Friday - June 29, 2012 Phu Vinh Village is 7km from west of Nha Trang City. Here, the scenery is very charming and romantic. The village has a 200- year history, and existing for hundreds of years, lots of ancient houses have been still “living” as historic witnesses, invaluable presents offered by nature. Located in Vinh Thanh Commune,Nha Trang City, Khanh Hoa province, the Village boasts a typical exquisite attraction with ancient houses in a cool green natural scenery. 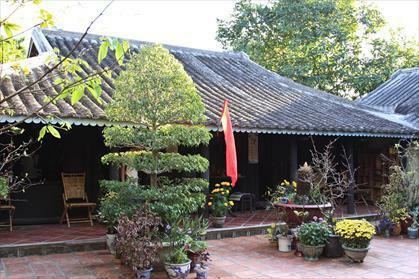 The first highlight is Mr. Nguyen Xuan Hai’s ancient house (Vinh Thanh Commune, Nha Trang City). 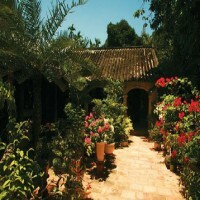 It has been a tourist destination for a long time as it is located hidden in a large 1,500m2 garden. Furniture sets of precious wood are so attractive beneath vast tree canopies together with fine cups made of baked soil, teapots of dry coconut shells remind us of the sight of the old Vietnamese countryside that tourists in Vietnam tours enjoy very much. They are not only the places for family get-togethers but also skilful hand-made works of art that help to keep Vietnamese traditional culture. 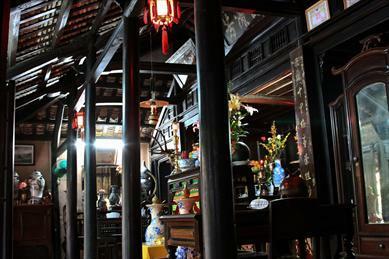 The view of the ancient house will bring huge pleasure to tourists. Interestingly, to touch all the items and furniture here. There is a lush orchard garden with orange, guava, durian, trees grown in front of the house. Visitors in Vietnam tours can taste the fruits beneath the shady trees, buy a teapot made of coconut shells or just contemplate skilful hand-made table sets hand made of tree roots in various forms. This is an ideal trip for those who love to discover ancient houses and items.